The culture of the streets of Macao is diversified and rich, with intertwining streets and alleys that developed at different periods in time, loaded with the cultural of its residents and witness the history of integration and harmonious coexistence of Western and Chinese culture in Macao. Macao Post will issue a thematic pack under the theme “Streets of Macao” on 22nd September 2015. The cover is presented with the painting of the Church of St. Lazarus Slope, where is full of Portuguese architecture style and as a gathering place for Macao artists. This pack comprises 4 series of stamps issued with the topics of Streets of Macao, which includes: the “Streets of Macao” issued in 2006, “Streets of Macao II” issued in 2013, the label stamps and definitive stamps of “Old Streets and Alleys” issued in 2015. 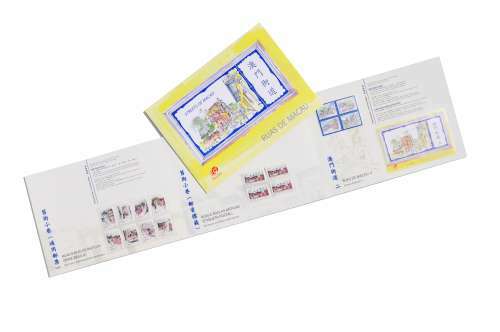 This pack will be available for sale at the Philatelic Shop of Macao Post Headquarters, “Rua do Campo” Post Office, Maritime Ferry Terminal Post Office, Airport Post Office, and the Communications Museum. The selling price is MOP150.00 each, it is certainly an excellent product, either as a collectable or as an elegant gift.